New survey results from a national online lettings agency suggests that residential property landlords fear a double hit from Section 24 and the proposed changes to tax relief – not only reducing their overall rental profits but also pushing many of them unknowingly into a higher tax bracket. 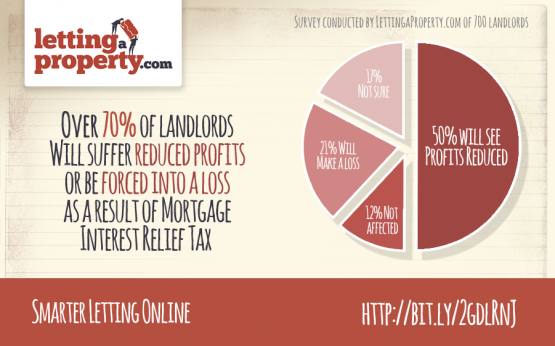 Survey showing results that was conducted by LettingaProperty.com. Coupled with the recent introduction of an additional 3% increase in stamp duty on second properties, investor landlords are, because of these changes, being targeted. According to LettingaProperty.com, tenants may also be hit hard by what is being referred to as a tenant tax, as 35% of the buy-to-let landlords questioned in their survey admitted they would sell their properties as the government seeks to change Mortgage Interest Relief – taxing them on income rather than profit. “That situation could result in many tenants losing their current homes either because landlords want to sell up or increase their rents to offset the financial impact of the new changes,” said Jonathan Daines, whose Midlands-based business, represents 20,000 private landlords across the UK. Under the changes to tax calculations, due to be phased in over four years from April 2017, landlords will no longer be able to claim relief on finance costs such as mortgages, loans and overdrafts. Ultimately, landlords will be taxed on rental income rather than profit. As a direct result of the above proposals, 50% of respondents said their overall rental profits would be reduced, with 21% saying they would be forced into making a loss and only 12% of respondents claiming no change when renting out their property. Interestingly, 17% of landlords were unsure exactly how their rental income would be affected. Leading onto how these proposed changes in tax relief would affect a landlords’ tax banding, 27% said they would be pushed into a higher rate tax band with 44% not expecting any change. Just 29% of landlords confessed to not knowing whether these tax relief changes would push them into the higher 40% tax bracket or not. “Although most landlords seem to understand the implications of these proposed changes in tax relief, it’s the 29% of uncertainty that is concerning. For many Landlords, the realisation that their disposable income may be dramatically affected will be unwelcome news, I am sure” said Mr. Daines. To mitigate the changes 74% of landlords said it was likely they would have to increase rents to cover losses. In addition, 35% would consider transferring ownership to a family member or into a company name with the latter action taking advantage of lower corporation tax rather than taking the larger hit on income tax. Mr. Daines added “Section 24, as we understand presently, will no doubt have a dramatic impact on the UK property market as a whole. If the intention is to bring back BTL properties to the ‘first time buyers’ market, then surely timely steps need to be taken to turn around those tenant occupiers to first time buyers. To do that, more measures and help from the government and lenders is required to accommodate those millions of would be first time buyers. “In the meantime, my concerns are with tenants who will face the brunt of these changes in the short term, as reduced landlord profits will need to be clawed back from somewhere. Section 24 survey results from a national online lettings agency suggests that residential property landlords fear reduced rental profits. Hitting landlords like this is unfair when they have spent years building up their portfolio,for the rules to suddenly change so drastically. Why not hit the wealthy overseas landlord?That just buy property to sit on that are empty or never used.